July 25, 2017 | But Will It Mix? Receiving up to 10GHz or higher with an RTLSDR and Sup-2400? Maybe. Update: June 2, 2015. I've removed the USRP version from the page. If I ever get a USRP to play/test with I will create a new image for it. 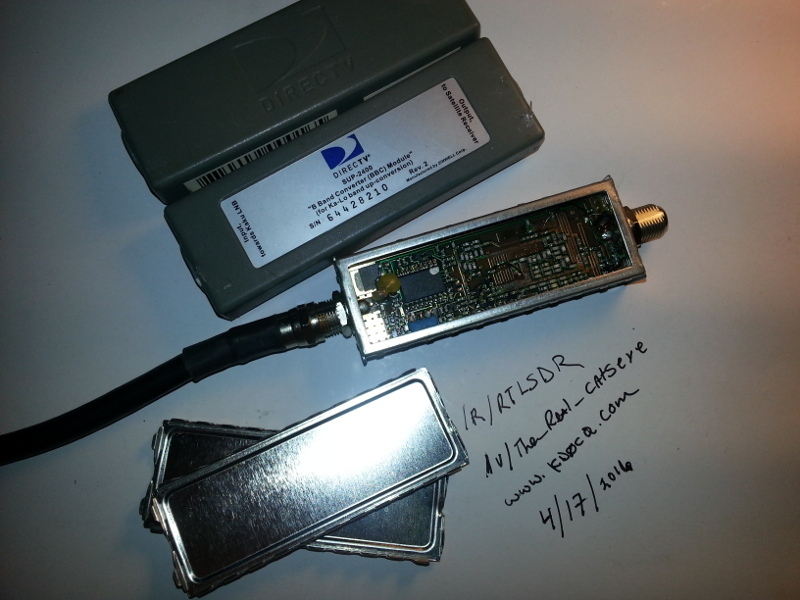 If you are looking for the RTL-SDR version then read on! This has been a bit of an undertaking fixing all the dependencies and compile errors, and hours upon hours (several days worth) of compiling. I put this together so I would have a nice SDR image to slap on when needed. I thought I might save you from the torture of downloading and compiling all the sdr apps and decoders needed to run your RTLSDR (and several other SDRs too!) on the BeagleBone Black. Save a few days of your life for something a little more productive. Anyway, I'm publishing it here. I'm sure there will be some issues here and there, and I'll work through them when they come up. However this is a good first step at a turnkey distro for SDR on the BBB. The desktop is LXDE and you may need MobaXterm to connect to the BBB desktop either over the network or via the USB cable. There is a text file on the desktop listing all the apps, the known issues on the BBB, and progress on apps not quite working yet. USRP is now supported. I'm still working on UHD (USRP) support and will update the image as soon as I get it working, or compiled anyway. Can't test an sdr I don't own… 🙁 It works great with RTLSDR though! You will need an 8Gb MicroSD card at a minimum. The download is 1.96GB and the img is just under 6 GB uncompressed. Others as I find them and resolve dependencies on this platform. If you have problems let me know. I will try to help you work them out. However, I encourage you to visit the authors site for the app in question. 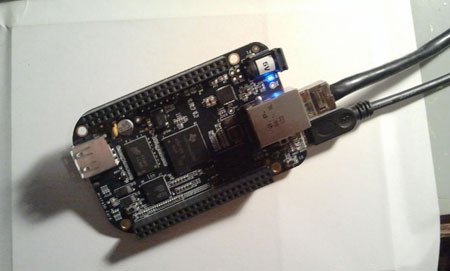 If you download and use this image for the BeagleBone Black please leave me some feedback in the comments below and do what you can to support the authors of the software you use. Without them none of this would be possible. USRP / UHD UPDATE: USRP is now supported. If you don't need support for the ETTUS Research USRP SDRs you can download the image above. I'm looking for somewhere to mirror these files. If you know of one or would like to mirror these BeagleBone Black images please let me know. Thanks. Follow this link to expand the file system to include the entire SD card. 73s and Thanks for reading! But Will It Mix? Receiving up to 10GHz or higher with an RTLSDR and Sup-2400? Maybe. 49 Comments on "Packed Full BeagleBone Black img file RTL-SDR + GNURadio + GQRX + Lots More on Ubuntu 14.04"
You are the Man! After spending coutless hours just trying to get GNUradio running on a linux Disto you have managed to get it to run on the BBB. Very nice. Now I have to purchase a BBB. Take Care. Really looking forward to trying this out. Thanks for working on this! Thanks for making this available. It's going to save people a lot of headaches. I had a couple of problems with it. I didn’t have any issues accessing the the rtlsdr hardware at all, but I’ll add that change. I’ll check on the entries in sources.list, not sure why a key would be missing all of a sudden. In reply to the other comment on the sudoers file, I’ll go ahead and clear that up too. I have a feeling that was something that slipped through on whoever made the original OS image. On another note, as I saw over on reddit there is a modified version of rtlsdr that extends the tuning range a bit. I’m going to include it in a seperate dir in case someone wants to play with it. Looks promising. I think the text file on the desktop needs updating too. I’ve added dump1090 and some other apps. Thanks for downloading and finding these issues. I’ll clear them up and reupload this evening/tonight. It also looks like there are 2 entries for %admin in /etc/sudoers. Thanks for doing this Chris! 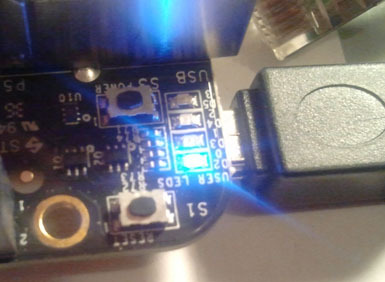 Good timing as I was wondering how to setup sdr on a dormant beaglebone black last night and found your article and sd image. Took a while to get Beaglebone to boot to the new sd but got it going on the third reboot. Playing around with rtl_tcp to gqrx on a mac and it works with some packet loss (good audio alternating with Mickey Mouse) but that may be from connecitng through the USB port. I've got a powered USB hub on order and will try over wifi. Also looking forward to hooking up HDMI and using the GUI. Great work! I look forward to following this project. would it possible to include in your image ? do you think that is complicated enable in your image the use of Chipsee display? maybe can you help me to do that? Fantastic!! I use Debian and Ubuntu on my other machines, and was looking for a Debian or Ubuntu distribution that I could use on my BBB and do something useful at the same time. The BBB is now my RTL-SDR "server"… Thank YOU very much!!! Got it up and running thanks to your image. What are my options for audio? It appears that the HDMI cable output audio but I have no way of testing that. I'm looking to pick a frequency such as 123.000 and broadcast it to broadcastify. Any suggestions? 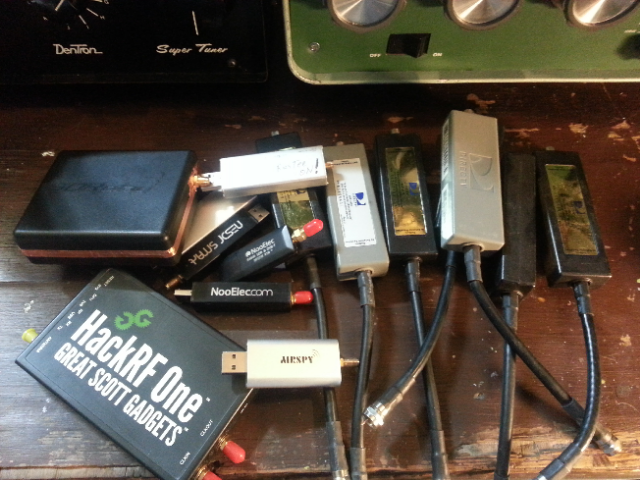 I use a $2 USB soundcard I got off ebay (3 of them, while I was getting) when I need to. Had to wait a few extra days since it shipped from China, but they work great. I love your work. But could you explained a little more how to use your image? I uncompessed the .tgz and get BBB_Ubuntu14.04_SDR-KD0CQ_v1. Then I used Win32 Disk Imager to write the file to SD card. Finally i insert the SD card to BBB and reboot it. It looks unable to boot from SD card. So I tried to check the SD card. With fdisk I found there is no partition on the SD card. Where did I make mistakes. Are you sure that BBB is mounting the SDcard? I’ll shoot you an email at the hotmail address you left. Be easier to troubleshoot that way. Is the image compatible with beaglebone white as well ? I guess I will just give it a try and see. This image is a real lifesaver. Got it working on my beaglebone white. So far the only problem is I can't get apt-get update / upgrade to work. Possibly due to the sources.list issue as written above. I downloaded your image yesterday and there still seems to be a problem with the key and repsoitories not being found as imipolex mentions above. Is there a fix for this? Many thanks for putting this together! Image is great. Great to have something so turn-key. One issue: It looks like HackRF is downloaded, but not built/installed (/usr/local/bin didn't contain hackrf_info for example) Also not sure if gr-osmosdr current, and includes hackrf. Hi! When I try to ssh root@192.168.7.2 it prompts me for a password, which isn't Temppwd. What do? Hey there Chris, nice job with this project. May I suggest adding gr-dsd and gqrx-digital to the mix? You can find them in the pybombs repo. Would make things a ton easier for those who want to dabble into digital modes esp. VHF and up. I'm having an issue with power management…the power button event isn't recognized by this image, and when I execute a shutdown -h, it reboots rather than powering down. Please advise if anyone was able to use HackRF with this image? This same device is right now running OK under SDR# on my Windows7 laptop, but being able to use it with BBB and freeing up the laptop would help a lot!.. Please help, what might be wrong? Thank you all a lot in advance. Whats the SU password please? I would like to configure a remotely accessable receiver so when I am travelling I can connect and listen to hf, copy cw etc. I was given a BBB that has the usb local access port broken off, so…since I don't have an hdmi monitor here in the ham shack I must access the BBB via ssh. I have downloaded the image that you were kind enough to provide and I have burned it to the BBB. When I execute the lsusb command via ssh I can see that the BBB recognizes the RTL-SDR so that's good. Been playing with this image and a Funcube Pro+ dongle. Currently – I cannot get the build to recognise the funcube (even after install the udev rules). Any pointers / ideas would be greatly appreciated. This is fantastic and has saved me so much time. Thank you. We would be happy to host your image for you in return. Please let me know if I can help. I'm very new to Linux. I have successfully burnt the image onto the BBB and when it boots I am able to log in with ubuntu/temppwd. Do I have to compile something to make the apps work or are they somewhere on the image and all I have to do is find them and execute by typing the file name? Nice job! Note that UHD_USRP source and sink blocks are missing in GNU Radio Companion. Hi ! I cannot boot this image . I can boot other images , like android and angstrom cloud9 but this cannot do . I am using rev.C with 4G Flash . I there any incompatibility ? Thank you for putting this package together. When I try to boot, I see all the boot messages go by, but then my monitor goes into power saving mode (no signal?). The last message I see is something about "Timeout waiting for Framedone". My BBB boots fine using a stock image. Can you tell us more about how USRP/UHD is supported in this image? As Art mentioned, I don't see the gnuradio blocks available with the python import command "from gnuradio import uhd". Also, usr/local/share doesn't have the uhd folder that is typically installed there with usrp bin files. Is the rtl module current? Trying with an RTL8232 dongle, system isn't recognizing the device and not loading the module. apt-get update and apt-get upgrade didn't change this behavior. The dongle is recognized by other hardware, and by my RPi and BB Black running Debian or Ubuntu 14.04 (BBB) with rtl-sdr installed. Thanks! After that you should be good. As a side note, I’m working on a Kali image that will be ready in a couple days. Thanks so much for the image. Can you (or anyone else) offer some tips basic getting started tips on how to execute run the apps you've included? ie just enter their names at the command line or do I need to spin up the GUI? Do you have an MD5 or a SHA hash for the image download? Having issues getting my BBB to boot and wanted to verify that I had a good image download. What is the username/password pair? And what is root password, if different? oh, nevermind (forgot the capital T). I’d like to add my thanks to the chorus for your work in producing this image. I tried it on a BBB but Gqrx was too sluggish on that board’s A9 processor. I’ve recently come across some TV set top boxes that claim to come with linux and have a speedier RK3288 A17 cpu: 1) Ugoos UT3s and 2) MK902II LE. Have you looked into these? There is a YouTube video demonstrating Gqrx with an rtl-sdr dongle on the MK902II LE – youtube.com/watch?v=JdhszJhJBtQ. Performance doesn’t look too bad on that video. I’m wondering how much pain the install would be. I’d appreciate any feedback & opinions. Thanks. I’m sure it would be easy enough to load/compile assuming there is an interface. I don’t have one so I can’t really comment on performance. first, thank you for all the work done on this image. i have problem to boot it. it start but not finish booting. i changed my "enviroment" and worked. with (Win7+IZarc+uSD class U1) generated a .img file with 1.5GB and didn't boot. it works fine with (win8+7zip+uSD class4) .img near 6GB and boots ok.
maybe the IZarc can't handle fine this tar/gz..
anyway, thank you for the image. very good job. I am a bit confused, how is it possible to get audio signal from beaglebone? Using either a USB sound card/dongle or via the HDMI interface. It’s been a while, I’ll need to revisit that to give an honest answer. Need to update the entire image with new decoders and more SDRs anyway. I’ll add that to my project list. I read this post fully concerning tthe resemblance oof newest and preceding technologies, it’s amazing article. Hello there, You’ve done a fantastic job. I will definitely digg it and personally recommend to my friends. Login info: user: ubuntu passwd: Temppwd (capital T) is not working. Did it change? 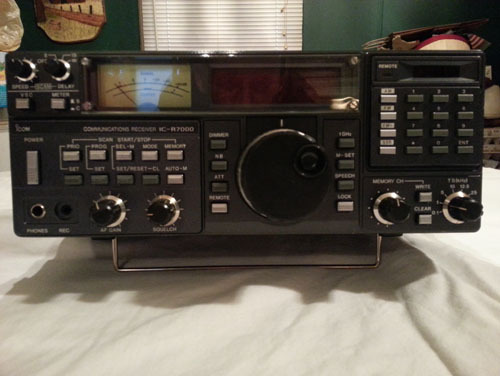 My passion is building and working on electronics, ham radio, and other RF related projects. I have too many projects going here at once and sometimes get overwhelmed. Occasionally I'll post about those projects here and provide updates when I can. In the near future I'll be posting on Arduino + ADF4351, RaspberryPi ham projects, HackRF, Airspy, RTLSDR, uW transverters, beacons and more.